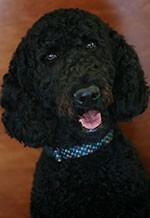 Remi is an American Kennel Club Standard Poodle who is in training for disability therapy. He loves to show off his cool dog tricks and hang out during the meeting. Remi has a gentle and even keeled temperament – he loves to give clients “high-fives”, chase lizards, take naps and eat treats. He is hypoallergenic and is safe for everyone. One key element of Remi's training is to be socialized daily and he is loved by staff, clients and office neighbors alike. A trip to Mooney Financial isn't complete without a visit with Remi! Ben is passionate about helping our clients build and grow to achieve their most desired outcomes. He is a valued partner who knows deeply the challenge that we all face when navigating the peaks and valleys of life. Ben helps align our clients' intentions with their actions through a comprehensive and transparent planning process. His goal is to provide a platform that secures financial freedom through personal and business planning analysis. This process enables business owners/key executives, employees and professionals to thrive in all stages of their planning. Ben is a Vermont native who holds a B.S. from Jacksonville University. He currently has his series 7, 63 and Life, Heath and Variable Annuity licenses. Kevin is the Director of Investment Operations at Mooney Financial. In this role, Kevin is dedicated to the development and articulation of market and investment strategies for Kyle's clients. He provides support around the areas of asset management, distribution strategies, portfolio construction, and investment allocation and is responsible for communications regarding market and economic insight for all of Kyle's Advisory clients. Kevin will often be present in meetings to address investments in both the business and personal planning space. Kevin is a Chartered Financial Analyst® and member of the CFA® Institute. The CFA® program is the most respected and recognized investment management designation in the world. Kevin also has his CERTIFIED FINANCIAL PLANNER® designation, and holds series 7 and 66 licenses. He graduated from the University of Florida with his B.A. in Economics and a minor in Business Administration. Maria Leon, who goes by “Gaby” is charged with the day-to-day operations of the firm. Execution and operational excellence are her bywords. She has the privilege to be involved in most facets of the firm, and has enjoyed being part of Exit Advisors growth and success. Gaby is fluent in three languages – Spanish, English and French and is a member of Beta Gamma Sigma. While attending Graduate school, Gaby served the rehabilitation community as an interpreter. Gaby earned her B.A. in International Business through Excelsior College in NY and her MBA through Jacksonville University in FL. She graduated with honors in 2015 and was recognized in Jacksonville Advantage Business Magazine as one of "Jacksonville's 2015 Top 40 Talent".